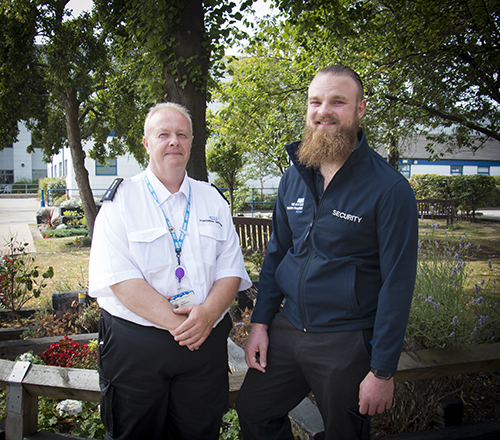 A hospital porter told how a security officer helped to save his life after he suffered a cardiac arrest near the main entrance to Hull Royal Infirmary. Shaun Marshall, 49, went outside for a breath of fresh air when he began to feel unwell during his morning shift at Hull Royal’s emergency department. However, security officer Josh Woolhouse rushed to help with two nurses after they spotted Shaun falling to the floor just inside the main entrance. A defibrillator was used to restart Shaun’s heart before he was rushed round to A&E on a trolley where emergency staff were able to save his life. Now back on the road to recovery and about to return to work, Shaun said: “If it wasn’t for Josh, I wouldn’t be here. “We’d had a few people off and I’d offered to change my shift so I shouldn’t really have been here. Shaun joined the trust as a porter in April and was asked to cover the early shift instead of his normal work pattern on May 30. He started to feel unwell as his shift progressed and by the time he was sent to A&E, he had to sit down and rest for a few minutes. Not feeling better, he headed towards the front of the tower block to get some fresh air but collapsed as he reached the lift lobby. Shaun said: “I’d never met Josh before but I owe him everything. He was first to reach me and he started chest compressions. I know two nurses came to help but if it hadn’t been for Josh reacting so quickly, I wouldn’t have made it. Josh, 23, joined security firm OCS three years ago and operates the CCTV and transports blood from the pathology labs to theatres as part of his role at Hull Royal Infirmary. He had just left the security office on the third floor at the start of his shift when he saw Shaun collapsing in front of him near the lift lobby. With an emergency crash team on the way, Josh lay Shaun on his side to clear his airway and ripped open Shaun’s shirt to begin chest compressions as other members of staff checked but couldn’t find a pulse. The crash team had raced to the lobby and took over while Josh then switched back to his day job and cleared the lobby of onlookers. Shaun has nominated Josh for one of the trust’s internal staff awards known as Moments of Magic after meeting up with Josh again to thank him. Josh said: “I’m not an emotional guy but when I saw him for the first time and he welled up, I’d to tell him to stop because that would have set me off. OCS Contract Manager Joe Moore has also recognised Josh’s outstanding efforts in the company’s internal awards scheme ‘MyThanks’.